Report in accordance with Article 173 of the Energy Transition for Green Growth Act. In its capacity as portfolio management company, Promepar Asset Management S.A. complies with the reporting requirements of Article 173 (paragraph VI) of the Energy Transition for Green Growth Act of 17 August 2015 by establishing the present report on its strategy for incorporating ESG information in its investment and risk management policy. Any company, irrespective of its sector of operation, should take care to incorporate social and environmental considerations in its activities for the purpose of observing sustainable development principles. Accordingly, each company should implement a CSR policy, and any company listed on the market should include a CSR chapter in its annual report. Analysing a company based on ESG criteria provides an assessment of the quality of its CSR policy, and an estimate of its contribution to sustainable development. A listed company should therefore not only endeavour to improve its financial performances, but also implement an effective, visible and proven CSR policy, or else run the risk of seeing its reputation – and by association its market performance – tarnished. ESG and SDGs: what’s it all about? E = stands for “Environment” and refers to the direct or indirect impacts of an issuer’s activities on the environment. Examples : waste management – water management – water/air pollution – consumption of resources – prevention of climate change – prevention of GHG emissions, etc. S = stands for “Social” and refers to an issuer’s impacts on all stakeholders, employees, suppliers, civil society, etc. Examples : healthcare – safety – human rights – equal opportunities – labour rights – union rights – working conditions along the supply chain – training – employer/employee dialogue – gender equality, etc. G = stands for “Governance” and refers to all the rules governing how a company is run and controlled. It defines the distribution of rights and obligations among the company’s various decision-makers, including shareholders and executive managers, and lays down the rules and procedures for how decisions are made. Examples : balance of powers – remuneration of executive managers – corruption – accounting transparency – quality of Management and the Board of Directors – sharing of powers – control and supervision of powers – transparency of shareholder communications, etc. 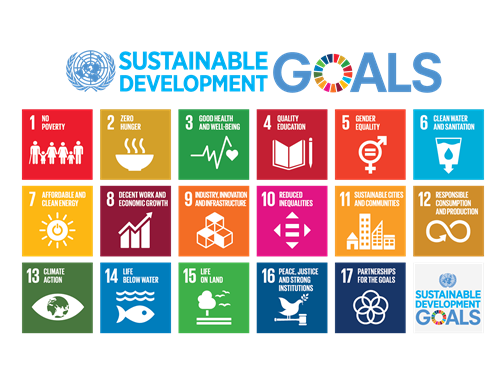 In 2015, the United Nations defined 17 Sustainable Development Goals (see below) forming 3 main pillars: Eradicating poverty – Protecting the planet – Promoting shared prosperity. Promepar AM firmly believes that the financial sector has a responsibility to steer capital flows towards companies that make a positive contribution to the achievement of these goals. Meeting the expectations of investors keen on reconciling financial performance and societal impacts. Encouraging positive changes in issuer practices through dialogue and voting at General Shareholders’ Meetings. Contributing to the Sustainable Development goals defined by major international organisations. Raising awareness, educating and communicating with our employees, our network of advisors and our clients on the importance of taking ESG criteria into consideration. Setting ourselves apart through our range of SRI funds of funds mandates. At Promepar AM, each portfolio manager places great emphasis on the information disclosed in CSR reports published by portfolio companies. Regular face-to-face meetings with issuers provide opportunities for dialogue, to discuss financial and ESG matters alike. When it comes to ESG considerations, special focus is placed on governance, i.e. the processes employed to manage, run and control the company. Promepar AM considers good governance to be a key indicator of a company’s balance, stability and sustainability, as well as the effectiveness of its strategy. The assessment of this criterion is all the more important in that it forms the very core of how Promepar AM exercises its voting rights at the General Meetings of companies (on the SBF 120 index) in which our funds are invested. Our governance assessment not only guides our investments, but also our voting on resolutions put forward at General Meetings. The principles of Promepar AM’s voting policy, which is reviewed once a year, aim to promote the long-term value enhancement of investments and to encourage transparency, consistency, integrity, fairness and sustainable development. We firmly believe that there is a close connection between the application of these principles and the company’s performance, and also that these principles have positive social and societal impacts. Before each vote, the team in charge analyses the resolutions and explains why it plans to vote a certain way; to that end, it relies on Promepar AM’s voting policy and on the recommendations of the AFG and Proxinvest, a firm specialising in corporate governance. Promepar AM supports external resolutions if they contribute to sustainable development. For the 2017 season, Promepar Asset Management voted at 69 General Meetings (1,485 resolutions), i.e. all meetings held by SBF 120 portfolio companies. Promepar Asset Management voted “no” at least once at 97.1% of the GMs, and voted “no” or abstained from voting on 37.6% of resolutions, reflecting its relatively strict voting policy with respect to issuers. By conducting regular dialogue with issuers and exercising our voting rights, we are helping to make progress on Corporate Social Responsibility and, consequently, on Environmental, Social and Governance issues. We do not stop at conventional financial analysis of the companies considered for investment. This financial analysis is necessary, of course, but not sufficient in and of itself. It is also important to take any (public) ESG information into account because it often provides a solid indication of the quality of the company’s management, its sustainability and, consequently, can highlight associated risks or investment opportunities. For the majority of portfolio companies, Promepar AM has established a comprehensive conventional financial analysis factsheet, which also include non-financial data, particularly on major environmental, social or governance matters. Promepar AM takes the COP21 Agreement (Paris 2015), and the environmental/societal consequences of global warming, very seriously. For that reason, Promepar AM is considering and planning to incorporate the carbon footprint measurement in its fund and stock picking process, although for the time being none of its funds has reached €500m in AuM. Scope 1: direct emissions from owned or controlled sources. Scope 2: indirect emissions from the generation of purchased energy. Scope 3: all indirect upstream and downstream emissions. The proposed approaches for measuring GHG emissions are many and varied, and sometimes difficult to compare. In particular, it is hard to find reliable data on Scope 3, which has a high risk of double counting between sectors. Contributing to the energy and ecological transition is not just about limiting GHG emissions, however, but also about encouraging companies and industrial sectors developing innovations and solutions to make this transition sustainable while meeting the goals of the other two sustainable development pillars (i.e. promoting shared prosperity and eradicating poverty). All Promepar AM employees are aware of the controversies affecting companies in which our portfolios are directly or indirectly invested. The reality, severity and consequences of environmental, social and societal issues are analysed and discussed. When controversial events arise, depending on their degree of severity, portfolio managers may make the decision to reduce/sell the positions or vote to sanction the companies at their General Meetings. Promepar is currently thinking about consolidating the ESG scores of portfolio companies and funds, available in its risk databases, for each mutual fund under management. Pursuant to the Ottawa and Oslo conventions (1997 and 2008, respectively), Promepar AM refuses to invest in companies or funds that own companies involved in the manufacture of anti-personnel mines and cluster bombs. Each profile is made up of funds selected not only for their financial performances, but also their ESG performances and engagement. Promepar AM favours SRI funds whose managers and ESG analysts demonstrate strong, well-supported commitment, and pays very close attention to the resources allocated by portfolio management companies in order to monitor the targets they set for issuers. Promepar AM sees this investment selection philosophy as a solution for encouraging fund managers (and in turn the companies they invest in) to make the necessary efforts and take action towards achieving the sustainable development goals. Promepar AM places great importance on providing its employees and network of advisors with training on Socially Responsible Investment. We also want to raise client awareness through (among other things) our monthly newsletter, which covers the key events of the day on ESG, CSR, SRI and EET issues. Promepar AM has been the asset management company of Bred Banque Populaire Group since 1974. Our job is to add value and grow the capital entrusted by our clients, while seeking to optimally manage the associated risks. Our Equity or Diversified mutual funds give voting rights to our portfolio managers. Just like ongoing dialogue between investors and issuers, voting rights contribute to the development of Corporate Social Responsibility (CSR) and the application of Environmental, Social and Governance (ESG) criteria in their activities and for all their stakeholders. As shareholders, we therefore consider it not just a right but also a duty to concern ourselves with the strategic, financial, operational and ESG aspects of the businesses in which we invest. This stance is reflected in our voting policy, in accordance with Articles 314-100 to 314-104 and 319-21 to 319-25 of the AMF General Regulations. This procedure explains in detail how the brokers and market platforms used by PROMEPAR Asset Management are selected for the execution of orders and/or provision of financial research. It allows the portfolio management company to comply with the regulatory provisions introduced by the texts listed below. In accordance with the provisions of Article 314-82 of the AMF General Regulations, PROMEPAR AM is required to report the conditions under which it called on third parties to provide investment decision-making and order execution services in 2017. PROMEPAR Asset Management places a premium value on fairness and the priority of its clients’ interests. In accordance with the law, PROMEPAR Asset Management has established a policy aimed at preventing and managing conflicts of interest liable to arise during the provision of investment services or related services, or a combination of such services, to one or more clients. This policy takes into account that PROMEPAR Asset Management belongs to the BRED Banque Populaire Group. PROMEPAR Asset Management ensures that its staff meet their professional obligations in the course of exercising their duties, as well as the regulatory provisions applicable to said duties. If, despite the precautions taken, conflicts of interest liable to prove detrimental to the client’s interests could not be avoided, PROMEPAR Asset Management’s procedures call for appropriate measures to be sought and undertaken in each situation. However, should such measures prove unable to avoid the risk of a detrimental impact to the client’s interests with virtual certainty, PROMEPAR Asset Management will clearly inform the client in sufficient detail, before acting on the client’s behalf, of the general nature or source of the associated conflicts of interest, in order to allow the client to make an informed decision. Promepar AM manages UCITS and AIFs and is therefore subject to both the UCITS V and AIFM directives. Promepar Asset Management is a subsidiary of BRED. BRED’s remuneration policy applies to Promepar AM’s employees, in accordance with the CRD IV Directive, in particular. The ESMA Guidelines, reiterated by the AMF (Positions DOC-2016-14 and DOC-2013-11), state that in the case of a portfolio management company belonging to a credit institution, subject to Directive CRD IV, there will be several overlaps in terms of remuneration policy but in the event of an inconsistency, the portfolio management company’s policy should comply with the provisions of the UCITS V Directive. This principle applies to the alignment of the employee’s interests with those of unitholders, particularly for any deferred variable portion of the employee’s pay. The Board of Directors of Promepar AM has approved the principles of the Promepar AM Remuneration Policy and assumes responsibility for ensuring that the portfolio management company complies with UCITS V. In accordance with the principle of proportionality, the company does not have its own Remuneration Committee. Identified staff, within the meaning of UCITS V: General Management, Portfolio Managers, RCCI (Head of Compliance and Internal Control” and Rick Controller. The objective of the remuneration policy is to promote the alignment of interests between the portfolio management company, its investors and its employees, along with sound and effective risk management. It does not encourage excessive risk-taking. Variable remuneration is discretionary, based on individual performances (achievement of annual or multi-year targets set by the manager, realistic short and MLT financial or non-financial targets, satisfactory risk and compliance management results, observation of laws, regulations and internal procedures) and collective performances (level of AuM, net inflows, investor satisfaction, internal client satisfaction). The principles of Promepar AM’s remuneration policy are based on fairness, engagement, competitiveness and cost discipline. Variable remuneration may be nil. The variable remuneration granted to the two executive managers and to employees is reviewed and validated by the Chairman of the Board of Directors of Promepar AM and by the Human Resources Division of BRED. Annual measures concerning the RCCI and Risk Controller are also subject to validation by the Head of Risks and Compliance of BRED Group. In the event either Promepar AM or BRED generates a negative financial performance, or if the strength of BRED’s financial position is compromised, no variable remuneration is granted, and only Promepar AM’s Supervisory Board can decide otherwise. Employees who leave the company (excluding cases of transfers within BRED Group or Groupe BPCE, retirement, no-fault dismissal or death) waive any bonuses (deferred or non-deferred) not already paid out at the date of their departure. Payment is made, however, in cases of internal transfers within Groupe BPCE, retirements, no-fault dismissals or death. Any guaranteed variable remuneration, where it exists, only applies upon hiring and is limited to one year. The portfolio management company has not established a discretionary pension policy (including for departures). The portfolio management company prohibits any coverage of pay changes incurred by payment instruments. The company has requested to apply the proportionality principle under UCITS V to its employees, in order to limit deferred payment in financial instruments to variable remuneration exceeding €100k. For identified staff receiving individual variable remuneration of more than €100k, 50% is paid in cash in the grant year in respect of the previous fiscal year, and 50% is deferred and payable in financial instruments in instalments of one-third over three years no earlier than 1st October of the three years following the grant year. The financial instrument used by Promepar is cash, indexed to an indicator, which may be specific to each employee and comprises a basket of units in funds managed by the company. Each individual indicator is reviewed and validated by the Chairman of the Board of Directors of Promepar AM. In line with the practices in force at the BRED Group, indexing is capped at the interest rate paid out on BRED cooperative shares over the period of deferred payment under consideration. Final vesting of each deferred portion is subject to the aforementioned performance and financial solidity criteria, and to the individual’s continued employment with the company. Pursuant to the Ottawa and Oslo conventions (1997 and 2008, respectively), PROMEPAR AM does not invest directly in stocks or bonds issued by companies that manufacture, sell, store and transfer cluster bombs and anti-personnel mines. Who collects your personal data ? How do we obtain personal data about you ? Who accesses your data ? Why are we processing your personal data ? How long are your data kept ? How do we ensure the security and confidentiality of your data ? Where is your data stored ? How to exercise your rights ?